Harrison – September 16, in the full assurance of faith, Angelina, the dearly beloved wife of James S Harrison, Glebe Point, Aged 46 years. In 1875 James, aged thirty-eight, married Jane Anne Crane aged twenty-two, the daughter of the magistrate William Crane (1833-1914) and Margaret Fairweather (1828-1870), and they made their home at ‘Corona’ Stanmore Road, Enmore until 1884. James and Jane had four children while living in Enmore: Elsie Jane (b. 1877), Frank Stanmore (b. 1878), Eric Fairweather (b. 1880) and Florence (b. 1882). In 1884, to accommodate the larger family and no doubt also because of his increasing prosperity, James purchased a significant estate with extensive gardens called Woodbury on Marrickville Road, Marrickville, where James was to live for the rest of his life. James was eventually to take up the profession of an accountant and probably began his working life around 1856, employed for a short time with Merrill and Leavitt, Shipping Agents, and then later with Buyers and Learmonth, Import Agents. When this firm was dissolved in 1861 a partner, Alexander Learmonth, formed a new partnership with Samuel Dickenson as merchants and commission agents, and James went to work for the new firm known as Learmonth, Dickenson and Co. Later, around 1866, and perhaps with the financial security afforded by a wealthy wife, James seems to have ventured into business for himself and dealt in, among others things, real estate and rental properties. He was also an auditor for the Bank of New South Wales from 1876 until 1902, and for his bother Layman Martin Harrison’s company Harrison, Jones and Devlin, from at least 1889 until 1900. He invested, with limited success, in various gold mining companies and also purchased various properties in Sydney and in the country. In the 1890s he leased grazing land and also owned some 4000 acres comprising Waverly Station, Ilford where he ran sheep and he maintained this interest as a grazier until his death. It was outside his working career, however, that the distinguishing features of James’ life were to be seen. As an accountant and administrator his skills were used by him in various forms of governance philanthropy. 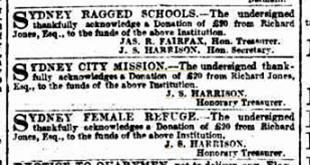 The advertisement from the Sydney Morning Herald, July 25, 1879, captures several of the interests and service that James gave, namely the Ragged Schools, the City Mission and the Female Refuge. He was involved with the Sydney Ragged Schools from 1867 and Secretary for the organisation for twenty-four years from 1868 to 1892, and he continued in membership of the committee until his death ten years later. He was a member of the committee of the Sydney City Mission for thirty-two years from 1870-1902 and the treasurer for twenty-five years. In addition to these charities he was a member of the governance committee of the Sydney Female Refuge Society from 1867 and the treasurer for thirty-four years from 1868 to 1902. He was also a member of the Board of the Model Lodging House Company (Limited). In 1872, James became the auditor of the Deaf and Dumb and Blind Institution (DDBI) and then became a director in 1879, a position he held for twenty-three years until his death in 1902. Jane, his wife, was a member of the Ladies Visiting Committee of the DDBI from 1893 to at least 1903. James was a member of the committee of the Home Visiting and Relief Society from 1873 until his death, giving thirty years of service to this organisation. In 1875, James became a member of the committee of the NSW Auxiliary of the British and Foreign Bible Society, a positon he occupied for twenty-seven years until 1902. In 1878, he became a Director of the newly formed ‘Sydney Model Lodging-House Company Ltd’ whose object was to ‘furnish in Sydney accommodation for the poor of the hard-working classes who have no home of their own’, a role he exercised for sixteen years until 1894. As a result of his time in Glebe he was also the auditor of the Glebe-based NSW Rifle Association for thirty-three years, from 1868 until 1902. While he took no part in their governance, for significant periods of time James was financially supportive of the Sailor’s Home, the Prince Alfred and Sydney Hospitals, as well as the Dorcas Society. During his lifetime those charities in which he exercised a governance role, such as the DDBI, the Ragged Schools and the Sydney Female Refuge, received most of his financial attention. His financial support and governance involvement with these three groups began in 1868 when he lived in Glebe and not long after his marriage to Angelina. Up until her death in 1873, Angelina also made donations in her own name to some of these charities, usually much larger donations than those made by James. It may well be that Angelina was a significant influence on James being involved in these particular charities, and it is probable that fellow Glebe residents John and Ann Goodlet, who were well known to the Harrisons and with whom James was to share decades of charitable involvement, were also influential. James was a devout and involved member of the Church of England being a founding member of St Clements, Marrickville, from 1886 until his death in 1902. He was a Synod representative of various parishes over the period 1878 to 1895 namely Holdsworth, Nowra and Marrickville. From time to time he served the Church of England, Diocese of Sydney, as a representative to the Council of Churches, as a member of the Standing Committee, as an Auditor to the Church Society, Standing Committee, Clergy Widows and Orphans Fund and the Superannuation Fund. He also gave his support to the Church Labor Home and to the Church of England Association. His giving to various charities was usually an annual donation of one or two guineas, but he was much more generous to Church of England causes. James died suddenly while in his garden at Woodbury as he was ‘busying himself with his flowers’. He had, perhaps presciently, made a new will a little over a month before his death in which he made numerous bequests. Most of his estate went to his immediate family but he stipulated, in biblical fashion, that a tithe of his estate on which duty was to be paid, should be given to charity. This tithe was allocated by him in the following manner: £100 each to the Deaf and Dumb and Blind Institution, the Sydney Female Refuge Society, the Ragged School, the Church of England Clergy Widows and Orphans fund in Sydney, the Bush Mission in Sydney, the Night Refuge in Francis Street, the Sydney Hospital, and the Home Visiting Society. To the Sydney City Mission, the Young Men’s Christian Association (YMCA), and the NSW Auxiliary of the British and Foreign Bible Society he allocated £500 each, and to the Church Society of the Diocese of Sydney he allocated £1000. The remainder of the tithe was allocated to the Church of England Building Loan Fund, Sydney. These amounts clearly indicate his interest in these groups as well as his priorities in his charitable giving. The only surprise is the large bequest to the YMCA as James did not appear to participate in the governance of that organization as he did for the other larger bequest charities, but in his early life he had been a keen supporter of the work. It would appear, however, that James was overly optimistic as to the value of his estate, which would have needed to be around £34,000 in order to meet these charitable bequests. His will made provision for such an eventuality, giving his Trustees permission to reduce the bequests proportional to the actual amount of the tithe of his estate on which duty was to be paid. When the government duties were taken into account the charities received approximately 60% of the amount James stipulated in his will. James was not a financial philanthropist to any significant or remarkable degree. He did give financial support to various charities of one or two guineas each year, and he gave annually to some of these charities for many years. He also left bequests to various groups, but this is not what marks James out as a philanthropist. It was said of him that he was ‘of a quiet disposition, and though an energetic worker, he was never a platform speaker’. James preferred to be a supporter of charitable causes though their administration and governance rather than in their public promotion. His accounting and administrative skills enabled him to be a governance philanthropist who gave not so much financially, though he did so, but through the giving of his time and talents. This he did to a remarkable degree often in the roles such as secretary or treasurer that required significant dedication and effort, and he did this for a number of causes and for considerable lengths of time. Bell’s Life in Sydney and Sporting Reviewer, January 6, 1849. SMH, April 20, 1850; May 21, 1850. SMH, March 6, 1851; November 12, 1853. Layman Harrison, Electoral Roll, Sydney, Phillip 1851/2. Illustrated Sydney News, June 16, 1866. Angelina was the beneficiary of her father’s estate and that of her first husband Thomas Cooper. SMH, June 9, 1877; February 10, 1884. Chris Clark, ‘Harrison, Eric Fairweather (1880–1948)’, Australian Dictionary of Biography, National Centre of Biography, Australian National University, http://adb.anu.edu.au/biography/harrison-eric-fairweather-6584/text11331, published in hardcopy 1983, [accessed September 1, 2014]. Jane was hiring servants for Woodbury in that year. SMH, November 14, 1884. SMH, December 10, 1856. This firm was dissolved in 1858. SMH, May 29, 1858. This firm was formed in 1851. SMH, July 3, 1851. James is working in Charlotte Place the location of Buyers and Learmonth in 1856. SMH, December 25, 1856. SMH, June 8, 1861. He is certainly employed there by 1866. SMH, August 4, 1866. From 1867 he is advertising various rental properties and his address is no longer at Learmonth, Dickinson and Co, Charlotte Place but simply at the Squatters Exchange, 267 George St. Learmonth, Dickinson and Co remained at this time in Charlotte Place. SMH, December 7, 1867. By 1887 he is operating from Bond Street Chambers. SMH, June 23, 1887. SMH, November 1, 1876, Maitland Weekly Mercury, May 31, 1902. He did not audit continuously over this period as the governance rules required that the auditor not serve continuously. Northern Star (Lismore, NSW), May 28, 1902. SMH, November 21, 1889, The Sydney Wool and Stock Journal, March 9, 1900. For background on the company see The Sydney Wool and Stock Journal, May 16, 1902. The Enterprise Gold Mining Company, Trunkey Creek. NSW Government Gazette 1869, page 3375. The company was unsuccessful and was wound up in December 1870. SMH, December 13, 1870. The Krohmann’s Gold Mining Company at Hawkins Hill, Hill End was more successful and paid good dividends for some time. In 1872 it paid 8s on a £1 share. NSW Government Gazette 1872 p1765. It was wound up in January 1878. SMH, January 26, 1878. Interestingly Richard Jones was a partner in James’ brother’s firm and of which James was an auditor. One purchase was in the town of Bega. NSW Government Gazette 1878, page 4312. He was doing this perhaps from about 1890. Australian Town and Country Journal, May 17, 1890. Supplement to NSW Government Gazette, no 75, January 30, 1895, p696, The Maitland Daily Mercury, January 21, 1895. Wellington Times, February 12, 1903. SMH, December 1867; September 5, 1868, Evening News, September 27, 1892, SMH, September 24, 1901. Empire, July 2, 1867, SMH, December 21, 1868, Australian Town and Country Journal, July 20, 1901. SMH, August 23, 1872, Australian Town and Country Journal, October 18, 1879, SMH, January 15, 1902. 50th Annual Report of the DDBI. Empire, July 29, 1873, SMH, March 10, 1897. SMH, March 16, 1875; April 18, 1901. It is possible that he was a member of the committee for 30 years from 1872. From 1872 to 1874 a JH Harrison is listed as member of the executive and this may be an error for JS Harrison. Evening News, March 12, 1872, Empire, March 10, 1875. SMH, May 30, 1894; Aug 16, 1878. SMH, August 4, 1868; March 13, 1902. SMH, December 4, 1878, The Telegraph and Shoalhaven Advertiser, December 11, 1879, The Shoalhaven Telegraph, June 11, 1885, SMH, August 31, 1887; April 11, 1888; January 21, 1889; August 5, 1891; August 17, 1892. He was not successful in being appointed representative of Marrickville in 1895, SMH, February 2, 1895. He was the representative for St Luke’s Sussex Street. SMH, February 1, 1895. Australian Town and Country Journal, March 15, 1902. St Andrews Cathedral Tower fund elicited a donation of eight guineas and the Church of England Centennial fund £100, a memorial for the late bishop £10. SMH, August 16, 1879; January 24, 1888, Australian Town and Country Journal, March 8, 1884. The Brisbane Courier, March 10, 1902. James Start Harrison, Last Will and Testament, Will No. 26051 New South Wales Will Books 1800-1952. NSW State Records. Bishop Langley recalling the early days of the YMCA remembered Harrison as one of the exceptionally earnest men in the early stages of the life of the YMCA. SMH, January 4, 1921. See The Scrutineer and Berrima District Press, July 4, 1906, SMH, September 25, 1906, Clarence and Richmond Examiner (Grafton, NSW), March 31, 1905, SMH, December 15, 1905. By phinaucohi in Philanthropy on October 4, 2014 .